In a room full of bankers and CEOs, the last thing you think you’d hear about is talk of the fifth dimension. 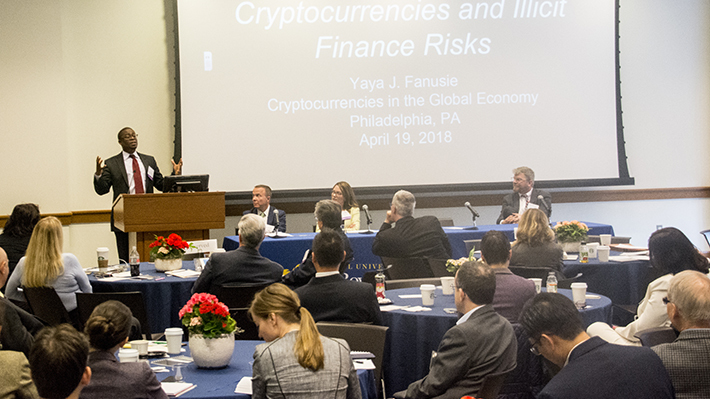 But that’s exactly where the conversation traveled in the third session, “The Future of Fintech and Cryptocurrencies,” of the 36th Annual Monetary and Trade Conference, presented on April 20 at Drexel LeBow and hosted jointly by the Global Interdependence Center, the Federal Reserve Bank of Philadelphia and LeBow College of Business. With this year’s focus on “Cryptocurrencies in the Global Economy,” bitcoin and blockchain were key topics in every session, but the last session took the topic one step further. Following a presentation on monetary forensics and the risks of cryptocurrencies by Yaya Fanusie, director of analysis at the Foundation for Defense of Democracies’ Center on Sanctions and Illicit Finance, Mike Warner, senior strategist at the Federal Reserve Bank, presented on the future of cryptocurrencies globally and how banks should incorporate them moving forward. “We’re at the precipice of a shift in economic exchange,” said Warner. He advised members in the room to refrain from dismissing blockchain and cryptocurrencies because they are the future of monetary exchange. According to Warner, if anything can tell you about the nature of currency, it’s the large limestone discs people once traded on the island of Yap. Used for larger purchases and often only traded through verbal agreement, Warner says the theoretical nature of these discs are the foundation of how we should view money and are a marker of how we should approach accepting cryptocurrencies in the future. “It would be a mistake to dismiss cryptocurrencies entirely,” said Warner. He also suggested that cryptocurrency may be the future of money, just as paper money was once unheard of. The senior strategist and lead of the Innovation Lab for the Federal Reserve Bank asserted that as cryptocurrencies increase in popularity, so should their acceptance by larger banks – well into the fifth dimension. The third session included presentations by William Nelson, executive managing director, The Clearing House, and Isabelle Corbett, senior counsel and director of regulatory affairs, R3. The panel was moderated by George Tsetsekos, dean emeritus and Francis Professor of Finance. The third session was preceded by two sessions and keynotes including: a lunch keynote by Jon Nicolaisen, deputy governor of Norges Bank an opening keynote by Christine A. Parlour, chair of finance and accounting, University of California, Berkeley. The first session – moderated by Tsetsekos – focused on bitcoin and the place of cryptocurrencies in in monetary exchange. The panel included David Mills, deputy associate director, Board of Governors of the Federal Reserve System; Lin William Cong, assistant professor of finance, University of Chicago; Kim P. Huynh, senior research advisor, Bank of Canada; and Susan Akbarpour, CEO and co-founder, Mavatar. The second session was moderated by Michael G. Papaioannou, expert adviser, International Monetary Fund. The panel included Jim Cunha, senior vice president, Federal Reserve Bank of Boston; Gregory Cipolaro, CEO and senior analyst, Digital Asset Research; Antoine Martin, senior vice president, Federal Reserve Bank of New York; and Nolan Baurele, director of research, CoinDesk. The one-day conference was opened with remarks by Dean Paul Jensen, Tsetsekos, and William G. Spaniel, senior vice president of the Federal Reserve Bank of Philadelphia.